When I started to make this quilt in 2015, it was a bit of an experiment. I hadn't ever run a Block of the Month program before, and I had no idea how it would be received. I also knew that my format for a BOM would be slightly different - I'm never one to do things in the "usual" way. As a result, this new Happy Days book comes to you as a rather unique proposition. It it quite a complex design, containing traditional piecing, Foundation Paper piecing, English Paper Piecing, hand applique and a lot more - however the book is broken down to be made in order of difficulty from start to finish, so you build on your skills as you sew. Each technique is explained and some have accompanying videos for you to access online. Making the Happy Days quilt gave me many happy days - and sharing it with the friends in my Block of the Month program has given me many more. I'm proud to now be able to share it with YOU - and I look forward to seeing the results of your happy days stitching. What do you get when you purchase the book? 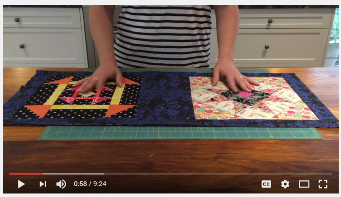 "I'd just like to say that given the broad spectrum of colour choices and abilities within this lovely group - Sarah's design, tutorials and coaching have produced an outstanding array of quilts. Some blocks have tested us, some have been a doddle, and some have resulted in new words, but without a doubt every person here has more skills than they did at the beginning of the journey. Each and every quilt is an absolute masterpiece. "As the photos of the finished quilts roll in, I have to hand it to Sarah....EVERY one of these quilts is gorgeous. And you know we all have a wide variety of skill! So the common denominator is this great quilt design:) I'm beginning to think there was a whole lot of thought put into making us all look like superstars.....;)"
"What I love about this BOM is that everyone has put their own personal twist on this gorgeous quilt to make it their own, as opposed to some BOM which come with fabrics were we all end up with a quilt that looks the same....... certainly not the case here.....hats of to Sarah Fielke :)"
"This is the first BOM I've joined, for this very reason. I discovered Sarah through her first Craftsy class and was captivated by encouragement - actually insistence - that we experiment with ideas she was presenting and make.them our own. She expresses such confidence in her students. No wonder there are Fielke Fanatics around the globe! Thanks, Sarah!!"